Birds of a feather flock together, and apparently for this owl, at least, so do cats. Please meet Cleo and Forbi. They are the most unlikely and ready-for-prime-time animal duo out there. 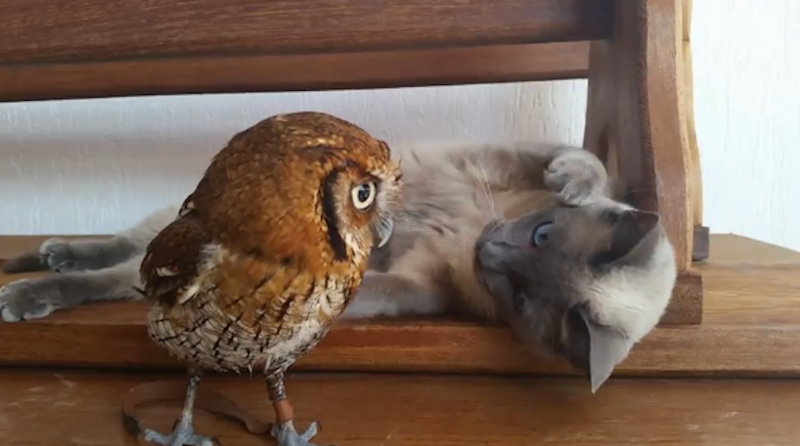 Because this cat and owl met when they were both young creatures, they were able to overcome their natural inclination to hate each other, leading to this beautiful lifelong friendship. Someone write them a theme song so I can go ahead and memorize it already, OK? Even though from reading the caption I knew that these two are buds, I still kind of held my breath when the kitty reached out playfully to pat the owl with one paw. I was all, “Ah, claws! Bird! Flee!” But this kitty is the master of the soft touch, and the owl clearly loved bumping up against his favorite buddy. I love these two. Let the fan-casting begin. Which celebs would you pick to voice these animals in a movie about their unusual love?